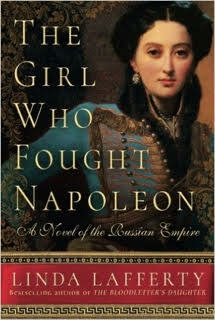 I received a free copy of The Girl Who Fought Napoleon for my honest review from TLC Book Tours. I have to admit that when I took this book to review I had no idea it was based on a real person. Nadezhda Durova lived and did ride in the cavalry. She wrote her memoirs and this book uses them to create a richer, fictional tale about a woman who defied the normal path set out for women of her time. There is so much possibility here for an amazing novel. Heck the truth is almost too amazing to believe. But the structure of the book makes it is very hard to get into from the start. Like an awful lot of books lately it uses the back and forth in time and alternate chapter/voice method for telling the tale but the chapter titles don’t give you much more than a date. You have to figure out who is narrating the chapter with the reading of it. In the early chapters this proved, at times, challenging. It’s also just getting old as a conceit. Seriously people – just tell your stories. Nadya is a complicated character and like most of that type there are times you love her and times you hate her. She is very well developed and she really drives the story. The chapters where she is not telling the story are not as vibrant. They are not in a single voice as her story is and perhaps that is why. I did enjoy the book; I always love learning about fascinating women in history and Nadya sure qualifies on that count. A woman who runs away from home to ride in the cavalry is a rare woman indeed. Russian history is a particular interest of mine as well mostly due to a wonderful professor in college. He brought the country alive while teaching. I think the book is certainly worth reading despite it’s construction flaws. Nadya is a woman who deserves her attention. One lucky reader (US/Can) will win a copy of The Girl Who Fought Napoleon. Just enter as many ways as you would like on the Gleam widget below. Full rules are on the widget. Good luck everyone.